The graduates of Agriculture are specialists in modern technologies in agricultural production (plant and livestock), as well as in managing and organizing farms and companies related to agriculture. They are also practically prepared to run the farm by themselves in an independent way (including horticulture), as well as agritourism farms or farm and food companies. They can work in state or local government departments related to the agriculture, in banks, agricultural advisory services, companies involved in the trade of agricultural products, institutions associated with the protection of environment or organizing various forms of recreation in rural areas, including organized tourism. Graduates are also prepared to work as managers and renewable energy experts in administration, building and construction, heat engineering, banking and financial sector (as a consultant), companies related to the energy trade and are able to start their own businesses in the field of renewable energy. 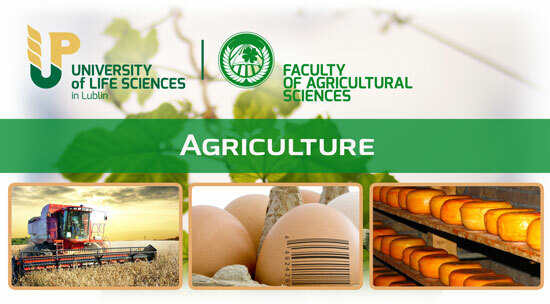 The Faculty of Agricultural Sciences in Zamość offers two degree full-time studies. Engineer – I degree studies last for 7 semesters and the graduate receives a professional title of an Engineer. Master – II degree studies also take place in Zamość and last for 3 semesters. The graduate receives a Master’s diploma. The student can choose different specialities during I degree studies and II degree studies, which means that the graduate of Master studies can have 2 specialities. Besides the knowledge and skills in agriculture the graduates have the ability to assess the potential threats to the environment. They know the methods of determining the rate of environmental degradation and ways to prevent these threats and eliminate them. They have the knowledge of sustainable development and nature conservation as well as skills of environmental management. They also have a basic knowledge of the legal issues related to agriculture system and the protection of environment. The graduates of this speciality may be employed in agricultural production or related institutions, consultancy and education. They can manage plant production in the protected areas (national parks, water intakes zones, eroded areas, etc. ), areas contaminated by industry, institutions associated with the environmental protection at various levels of government administration. In addition to the general agricultural knowledge the graduates also have extended qualifications in economics, marketing and management, organizing farms and businesses. During the studies, the students learn how to combine technological competence in the field of agriculture with professional preparation to make decisions related to the management of agribusiness companies, especially in financial management and marketing. The graduates receive the knowledge of economy, finance, marketing and management. They know how to analyze and evaluate the production and trade activity. They are professionally prepared to manage farms, commercial and service companies and food companies . They can be employed in the institutions working for rural areas purposes, such as municipal offices and banks. The graduates have a general knowledge of agriculture and specific knowledge of the proper way of organizing the recreation in rural environment. They are able to assess the tourist value of rural areas and know the regulations of establishing and running farm tourism. They can organize leisure activities in rural areas and have the abilities related to organized tourism. The graduates acquire a general knowledge of various renewable energy sources (RES). They know the details of power conversion technologies contained in various sources into useful energy. They understand the role of renewable energy in the economy. They have the knowledge of energy development strategies and legal requirements related to them. They are prepared to estimate the resources of particular sources of energy and to design the location, type, size, and other parameters of energy investment based on renewable sources. Because the particular stress is put on the energetic usage of biomass, it will help the graduates to produce energy crops and converse them into different biomass energy sources. In the same way they are able to prepare a balance of energy resources, applications for subsidies, and the analysis of investment feasibility. They can estimate the energy needs of buildings and units of local government, draw up a comparative analysis of the cost of conventional and renewable energy or the environmental impact of different energy sources. They can optimize the selection of energy sources in terms of economics , environment and logistics, according to the current legislation. They have the ability to prepare energy audit, to plan investment process and to develop a business plan. They can work as managers and renewable energy experts in administration, building, heat engineering, banking and financial sector (as a consultant), companies related to the energy sector and they can start their own business. The graduates with Master’s degree in agricultural engineering, have an extensive technological knowledge of plant and animal production, as well as the economics and organization of agribusiness companies. They know the methods and techniques of counseling. Thanks to the skills of interpersonal communication they can promote the latest achievements of science and specialist knowledge. They can stay in a direct contact with farmers, advise them in determining the individual direction of development of their farms and help them to obtain external funds. They are prepared to participate actively in building a modern system of agricultural advisory. They have the competence to run their own business, work in agribusiness companies or state and local administration. The graduates are also equipped with practical skills in obtaining funds for agriculture and rural development, searching for market information, financial and accounting consulting for effective competition on the market of consulting services. They are also prepared to run their own businesses, including the consulting, working in institutions operating in agriculture and state or local administration.